Traditional patterns are back in style. French/Hungarian fir is a pattern made from slats that are cut out at the same angle, as the angle at which they are laid. Boards in French fir are cut out at 45 degrees angle and boards in Hungarian fir at 60 degrees angle. This pattern has been used for years. Lately it has been a little forgotten but now it’s making a comeback in great style. It’s considered to be very classical but it matches really well with modern interiors. It’s timeless. It’s a zigzag pattern where board joints resemble arrows. Slats can be laid the traditional way but it’s also common to use bars separating the strips. 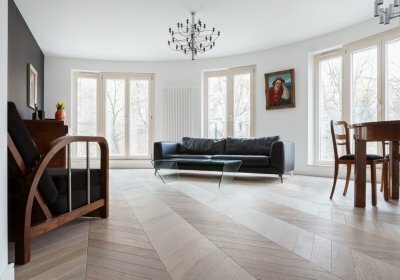 While laying the floor in French or Hungarian fir we always start from the center of the room and continue radially oriented towards the walls.